Avast! 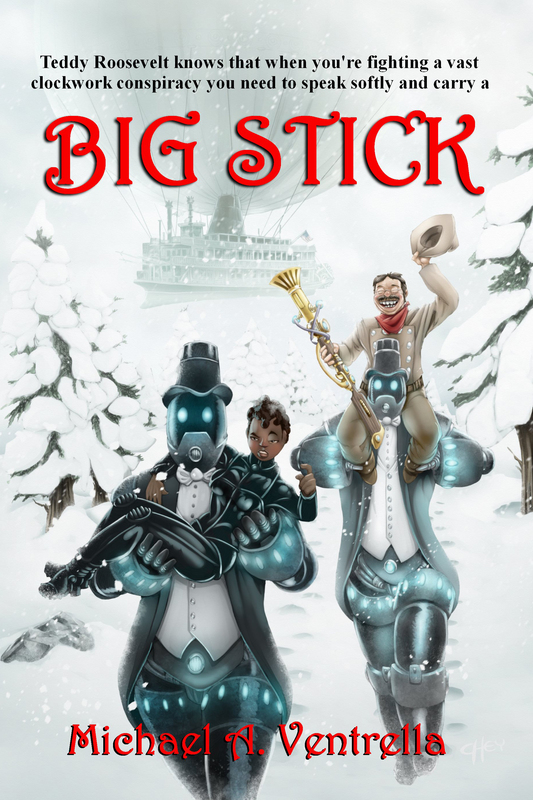 There be a new pirate story from that scalawag Michael A. Ventrella! 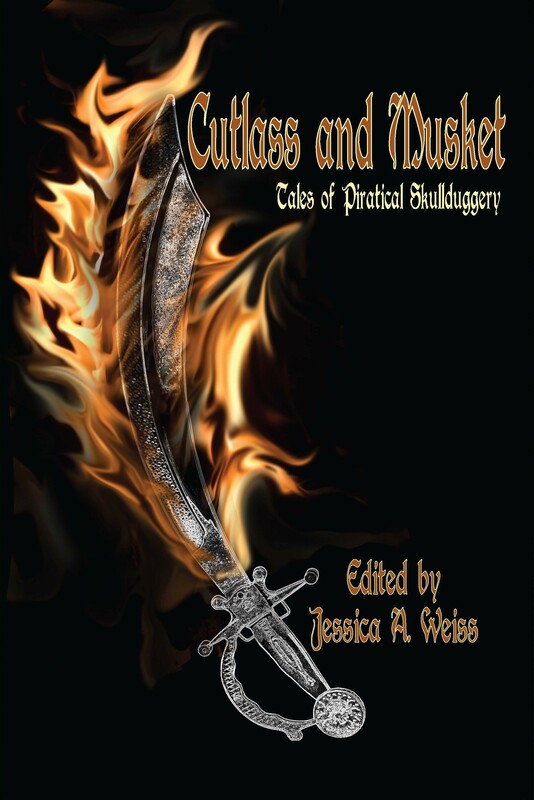 This one tells of another adventure of Captain Irad and Greenie, and it be called “Get Kraken!” It be the lead story in a new collection called CUTLASS AND MUSKET: TALES OF PIRATICAL SKULLDUGGERY available now from Wicked East Press. Ye can order a copy here. Bart swallowed deeply as his hand subconsciously rose to his neck. Through the cage bars, he watched mournfully while the hangman placed the noose around the neck of Captain Irad of The Prickly Rose. Once the hangman finished off Irad, Bart and the rest of the crew would be marched up the gallows, one by one, to meet a similar fate. The crowd stirred impatiently, anxious to see the famed pirate meet his maker. Sonia raised an eyebrow. “You want to see what bad luck is, boy?” She pointed a finger at the crewman. Dogbone’s eyes widened and he sat forcefully down in the small space available. “No, ma’am. I be quiet.” His head shrunk into his shoulders and he looked away through the bars, avoiding eye contact with the famed voodoo queen. The other crewman had long since given up hope. They crowded together, staring out to sea, resigned to their fate. Irad suddenly looked up. His mane of reddish blonde hair whirled around him like a fire as he tossed back his head and laughed. Higgins crossed his arms and smiled broadly. The bright Caribbean sun gleamed off his shaved head, making it difficult for direct eye contact with the man. His red coat was neatly pressed, buttons polished, and his regulation sword hung by his side like a trophy. Higgins’ smile disappeared. “Yes. Well. Goodbye.” He walked away, signaling to the hangman to do his job. Higgings turned and held his hand up. The hangman paused. “Arrr, ye cut me to the quick, ye do.” Irad shrugged the best he could with his hands tied behind him. “’Tis just a shame, that’s all. The kraken’s been attackin’ ships in this area forever, and just when I discover how to defeat the beast, I get hanged, taking the secret with me. Ah well, that be life. Or death.” He laughed at his own meager joke. Higgins climbed the steps to the gallows and the hangman backed away to give him room. Planting his feet forcefully in front of Irad, Higgins once more crossed his arms. The crowd grew silent. Bart pushed his way past his fellow prisoners to get a better view. Higgins stared into Irad’s eyes for long seconds. “Your promises are meaningless.” He walked away and motioned to the hangman, who came forward and grasped the handle that would send Irad through the trap door, ending his life. Higgins held up his hand and began to speak the final word. The crowd held its breath. Higgins spun around to stare at the prisoners in the cell. Turning his back on Irad, Higgins marched down the wooden stairs of the gallows. His steps boomed in the crowd’s silence. The cage holding the crew of the The Prickly Rose stood about twenty feet from the platform. Armed redcoats surrounded it, and a prominent lock taunted the dirty and crowded inhabitants. Higgins stomped and stood before Bart. “What is your name?” he asked in a deliberately quiet and calm voice. “Greenie, I order ye to shut the hell up!” yelled Irad. Higgins marched back to Irad. Bart winced as the other pirates kicked him. “Well, Captain Irad. Here, then, is my deal.” Higgins grinned. “I will release you and your crew and will provide you with a ship—no, not your ship, but a nice vessel that will serve your purpose. I will captain the ship to make sure you keep your promise. “What about me, sir?” asked Bart. Bart wiped his forehead as Irad’s laugh echoed in his ears. Get Kraken is such a good title for a story ye blasted sour-faced bugswallower! I’m looking forward to reading the rest of the story, Michael. A pleasure to be sharing a ToC with you. All the best, Mark. Looking forward to receiving my copy of the book so I can check out all the other stories included. I am happy to be part of this project and agree with Mark — Stellar title choice.